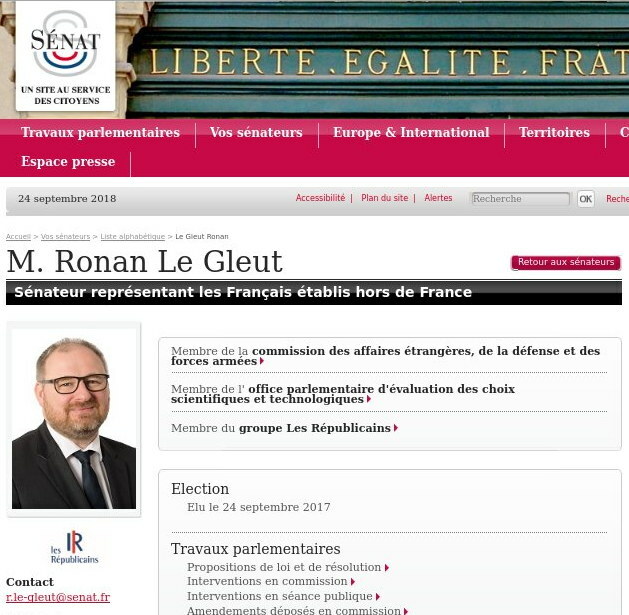 There is one senator who might take a particular interest in the Benalla hearings: Ronan Le Gleut, who is since 2017 a senator with a six year mandate representing the electoral district of French Citizens residing Abroad. He is technically on leave from the EPO for duration of his mandate. Le Gleut is only 42, which is quite young for a senator. but would be close to 50 if and when he were to resume his career as an examiner at whatever will be left then of the EPO, after having been a member of various senatorial working groups on exciting subjects such as Brexit. “Let’s hope he [Benalla] didn’t do like he did in France and carry his fetish beyond the limits of EPO premises. That would have been an iffy proposition even within.”According to my information, he had previously run for various offices on a right wing ticket (Sarkozy’s party), until he squeaked through thanks to quirks of proportional representation mathematics by founding his own party list of which he was the sole candidate. It will be interesting to see where his loyalties would lie, if he has any involvement in the hearings… He is in the opposition to Macron’s party, but belongs to Battistelli’s.